Sweaty palms – Enough moisture to flatten . . . well, even Harry Potter’s hair. Out of control heartbeat – As if you ate all your Halloween candy right before. Rapid breathing – making it look as if you finished a 5K only moments ago. Yes, the embarrassing symptom list goes on: developing facial rashes, hands shaking uncontrollably, voice quivering with angst, and of course, the all-time favorite—going completely blank, only to stare at a room of strangers like a deer in headlights. The good news is . . . it’s not our fault. Sure, the fear of speaking in public and presenting to others ranks right up there with the fear of death. However, it’s important to remember that the fear symptoms we manifest are simply a physiological response to survival instincts. Our bodies’ intelligence knows full well that if we actually took the time to “think” of a solution when faced with a life threatening situation, we would not survive. This is because by the time we would have figured out a solution, the lion would have likely already eaten us. For the human race to survive, our defense system needed an immediate response to fear in order to either fight off life threatening danger, flee as quickly as possible, or freeze until the danger went away. Two of these reactions I happen to witness when taking my dog outside on a hot summer night. Apparently, when it’s dark and hot, all toads love to be going about their business. Unfortunately for toads–at least, in my neighborhood–our dog happens to be fascinated with them. When my dog senses a toad nearby, of course, he tries to go after it. We hold him back with the leash, but the toads always sense predator danger and freeze. They remain as still as possible and then when they think their environment has improved, they flee or shall we say, jump to safety. Equipped with a defense system ourselves, this can certainly be helpful in dangerous situations, but the challenge is that we can feel anxiety and fear in all kinds of situations, and not exclusively life threatening ones. Have you observed your reaction to touching something hot? For example, when you accidentally touch a hot burner (not that we want to make that a habit) your response is similar to how your body reacts to any seemingly threatening presentation. It’s an automatic response. The point is that by the time your reflexes saved your finger, your brain was just getting the message. So if our bodies waited for thoughts to catch up, well, let’s just say – it’s a good thing, it doesn’t. Once again though, it’s not entirely our fault. High order thinking skills are also inhibited during the physiological response to fear, because equipping you for fight or flight is the higher priority. Now, of course, speaking in front of strangers is technically not a life threatening situation. However, our physiology will still respond with a defensive reaction to any situation where we feel severe anxiety or fear. So whether life threatening or not, anxiety triggers your body to begin protecting you by shunting oxygenated blood to your limbs, accelerating your heart rate and overall equipping you to get out of danger’s way. So what do we fear about speaking in front of others? Well, we might be afraid of looking stupid, embarrassing ourselves, the unknown, being the focal point of attention, having all eyes in the room on you, and the list goes on. 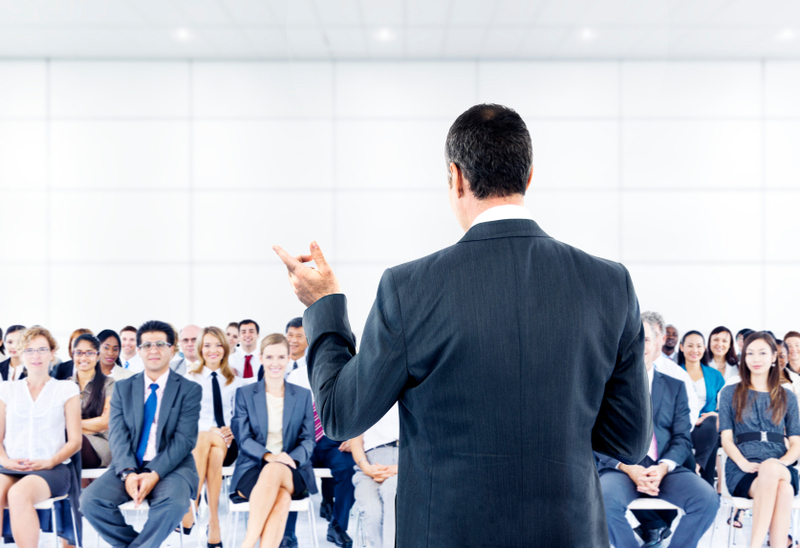 The good news is that there are many things we can do to manage speech anxiety and move forward to deliver effective, memorable, and powerful presentations. Stay tuned as we dedicate the next series of blog entries to what you can do to manage your own speech anxiety and rise above it. Most importantly, remember that any speech anxiety you feel is a natural biological reaction. That alone should make you feel better.